The oldest Japanese garden in the United States is an oasis of calm and a place to soothe the soul, nestled away in Golden Gate Park. Located inside Golden Gate Park, directly next door to the de Young Museum, this beautiful garden is a real treat for the senses and a wonderful oasis of calm in the middle of this busy city. There are beautifully sculpted gardens, miniature pagodas, small streams, stone lanterns, ponds containing huge koi fish, and cherry blossom trees. The scenery is very photogenic and there are so many intricate details to discover as you walk over the moon bridge and along the winding pathways. Take your time looking round. Don’t rush. There’s so much to enjoy here. The garden was designed and developed by landscape gardener Baron Makato Hagiwara back in 1894 and was intended as a temporary exhibit for the World’s Fair in San Francisco. When the fair closed, however, Hagiwara decided it should remain and become a permanent feature. The Hagiwara family maintained the garden right up until 1942. Spend a few tranquil moments in the meditative Zen Garden, dedicated at the same time as the 4082-kilogramme Lantern of Peace, as a symbol of friendship for future generations. Listen to the relaxing sound of the many water features while you kick back and enjoy the scenery. Hagiwara brought 1000 cherry blossom trees all the way from Japan to the garden during its construction. Today, the Japanese Tea Garden, a glorious sight all year-round, is worth a visit during the spring when these trees and the garden’s many azaleas are in full bloom. These spectacular blooms are transient but bring real beauty to the garden at this time of year. For a visual treat, the autumn is another good time to visit, when the leaves present a rich and colourful display. Overlooking the garden’s beautiful landscape and pond, you’ll find the Tea House. 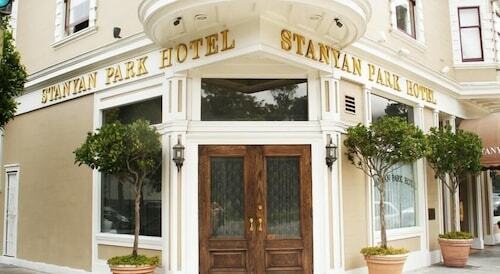 Finish your walk here by enjoying a refreshing cup of green or jasmine tea. Tuck into a steaming bowl of miso soup or buy a fortune cookie for a few words of wisdom. If you happen to be visiting on a Wednesday or a Friday morning, from mid-March to January, kimono-wearing staff members perform a traditional tea ceremony, demonstrating centuries-old rituals and practices that present the matcha, a powdered green tea. Take a trip to “The Rock”, home to the infamous and abandoned island prison, and discover how it earned its reputation as a bleak and unforgiving place. One of the most iconic bridges in the world, walk the 2.7-kilometre marvel of engineering for the best views over the bay and the ocean beyond, fog permitting. This former military base combines history and culture with open spaces, spectacular views and the Jedi Master Yoda! This golden stretch of beach at the foot of the imposing serpentine cliffs offers panoramic views of the Golden Gate Bridge and the Marin Headlands. This waterfront location has a mix of thrilling rides and lively street entertainment, but watching the sea lions hanging out in the bay wins the day! This Roman-inspired palace is one of San Francisco’s beautiful treasures and remains a modern-day renaissance centre of fine arts and science. Enjoy the tranquil beauty of this beloved park in this oasis of calm away from the bustle of the city, yet right in San Francisco’s backyard. This vast scientific institution is one of the world’s largest natural history museums. Use all your senses as you explore science through dozens of interactive exhibits at San Francisco’s famous museum on Pier 15. This famous fine arts museum in Golden Gate Park was founded in the 19th century and offers an engaging space for plenty of creative exploration. Step aboard century-old ships, watch boat builders at work, browse exhibits about U.S. maritime heritage and enjoy scenic picnics at this historic waterfront district. Bring your camera to capture the iconic, colorfully painted, Victorian-style houses and the downtown cityscape from this well-known hilltop park. Go up to the top of this lofty peak on a clear day for unparalleled aerial views of San Francisco’s most recognizable landmarks. Relax on the sand, spot seabirds, fly kites and enjoy other outdoor activities at this secluded San Francisco beach. Browse high-end shops and see a Frank Lloyd Wright-designed building at this fashionable lane, which was once at the heart of San Francisco’s red-light district. Taste some of the city’s freshest sea food and catch some fabulous views in this waterfront neighbourhood dating back to the time of the gold rush. Fashion puts its best foot forward in one of America’s largest shopping plazas. From shipwrecks to the Sutro Baths, find adventure and plenty of photo opportunities around every corner in San Francisco’s stunning coastal park. Enjoy sun, surf and stunning views of the Golden Gate Bridge in this tiny secluded cove between Lands End and Baker Beach. Discover the man behind Mickey Mouse at this interactive museum located in the heart of San Francisco’s Presidio neighborhood. Admire the incredible array of blooms on display, from insect-eating plants to elaborately shaped orchids, at this well-preserved Victorian-era conservatory. Learn about the old-fashioned cable cars that have transported San Franciscans for generations as you tour around a historic powerhouse and working museum. Drive, bike or walk across the state-of-the-art bridge that connects San Francisco to Oakland and the East Bay beyond. Go boating on Golden Gate Park’s largest lake. The placid body of water is the home of turtles, ducks and during winter, Canadian geese. Walk through some of the most beautiful scenery in San Francisco along Lands End’s oceanfront trail from where you can see iconic sights such as the Golden Gate Bridge. 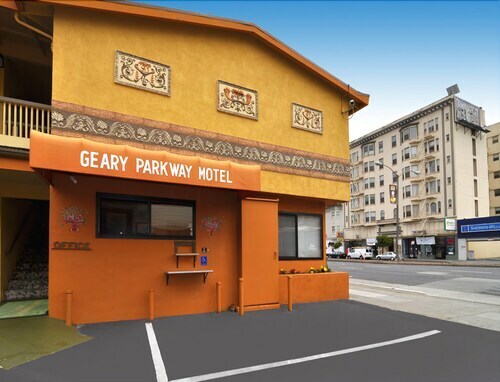 Located in Richmond District, this motel is within 1 mi (2 km) of Conservatory of Flowers, California Academy of Sciences, and De Young Museum. University of San Francisco and Golden Gate Park are also within 2 mi (3 km). 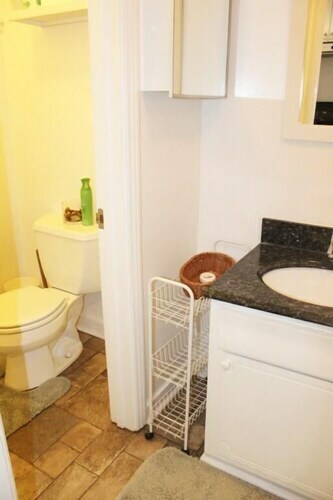 Located in Sunset District, this apartment building is within a 15-minute walk of University of California San Francisco, California Academy of Sciences, and UCSF Medical Center. Golden Gate Park and De Young Museum are also within 1 mi (2 km). Located in Haight-Ashbury, this hotel is within a 15-minute walk of Conservatory of Flowers and University of California San Francisco. California Academy of Sciences and University of San Francisco are also within 1 mi (2 km). 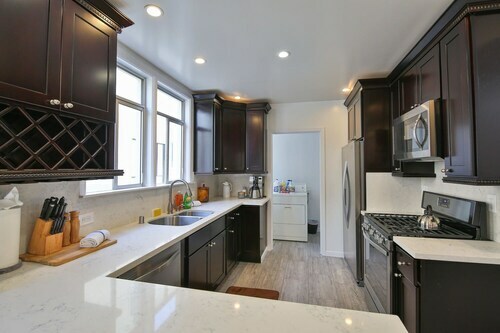 Located in Richmond District, this apartment building is within 1 mi (2 km) of Conservatory of Flowers, University of San Francisco, and California Academy of Sciences. Kaiser Permanente Medical Center and De Young Museum are also within 1 mi (2 km). 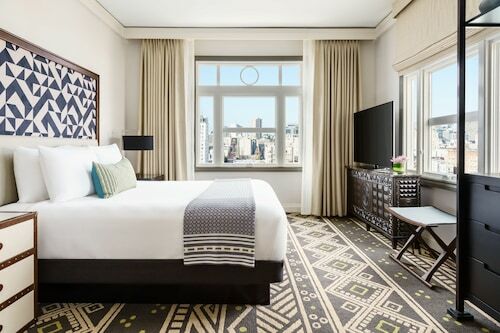 Located in Downtown San Francisco, this romantic hotel is within a 15-minute walk of Powell and Market Cable Car Turnaround, Asian Art Museum of San Francisco, and San Francisco Museum of Modern Art. Cable Car Museum and San Francisco City Hall are also within 1 mi (2 km). Powell St. Station is 7 minutes by foot and Civic Center Station is 11 minutes. Hotel Zoe Fisherman's Wharf is 2 blocks from Fisherman's Wharf, Pier 39, and the Alcatraz Island ferry. 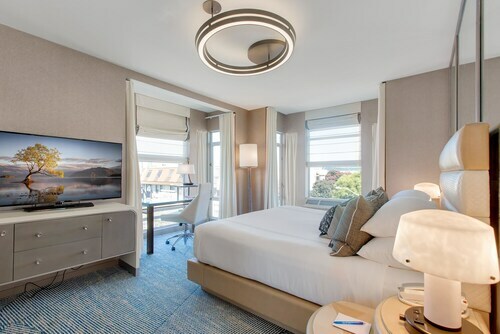 Located in Downtown San Francisco, this hotel is within a 10-minute walk of San Francisco City Hall, War Memorial Opera House, and Louise Davies Symphony Hall. Civic Center Station is 11 minutes by foot and Powell St. Station is 14 minutes. 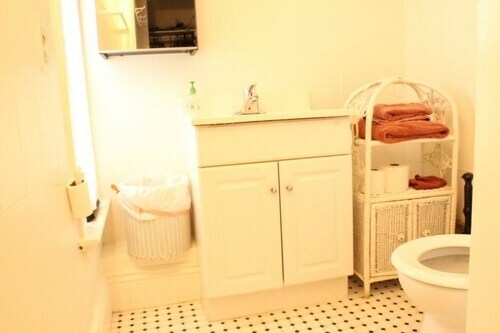 Located in Cole Valley, this apartment building is within 1 mi (2 km) of Conservatory of Flowers, University of California San Francisco, and University of San Francisco. Castro Street and UCSF Medical Center are also within 1 mi (2 km).